My husband had some medical problems for a few days. Quite frankly, I just didn't have time or energy to blog. I haven't been around to read and comment and haven't written a word of a post in almost two weeks. It is time to get up and started again! Lee, as most of you know, has a chronic and critical condition that requires him to be on a ventilator. In recent weeks he has had several physical setbacks and difficulties. We ended up at the hospital this past week for a procedure in same day surgery. We have been there many times in the past couple of years. The problem this time was that it all happened at the height of the Christmas Holidays. Therefore, since it was not an emergency room situation, we had to wait a few days to get in for the help he needed. We have been through this before and knew what to expect. 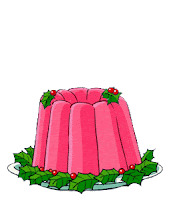 We just took care of things at home until Christmas was over and we could go for the relatively simple procedure. We spent most of the day Thursday at the hospital. Everything went well, as expected and we were home by late afternoon. Lee's health is, as always, fragile; but, we are almost back to what passes for normal at our house. Lee is not full of energy, but he is feeling better. I have almost recovered from the stress (OK--exhaustion!) that I go through when we have one of these situations. Anyway--enough of the pity party! God is good! We are both on the road to feeling better. We had an early Christmas with our children and had a great time! It turned out to be good that we had planned Christmas early because on Christmas Day we needed a somewhat quiet day around the House of S.
Yesterday I was talking to my sister on the phone. I happened to be sitting on the couch and started looking at the nativity which is still on the coffee table. It is one of the nativity sets that the grands know they can play with gently. I love to see what they do with it--Ella, age three, has been particularly interested in it this year. I kept admiring Ella's latest staging of the birth of Jesus and suddenly realized someone was missing. Can you see which important person is not here? but couldn't find her in the cast of characters. I just figured Ella had taken Mary to some other spot in the house. I went on talking to my sister. Later, right after I hung up from our long conversation and was sitting there finishing my cup of coffee, I found Mary. Try to get a few minutes just for yourself! I'll be around soon reading, commenting, and catching up! which is trnslated "God is with us." Boomama is hosting the Christmas Tour of Homes. I'm a little late! Real life took precedent yesterday. I'm so glad you came today! The first stop on my Christmas tour is my living room and dining room. Here is the Nativity Tree that I shared with you in this post. Near the tree is this curio cabinet that usually houses my husband's lighthouse collection. During this season it is home to most of our nativity collection. The latest addition to the nativity collection is on the dining room table. It was a gift from a son and dil last year. Santa and friends hang out in the kitchen and family room. with family pictures and mementos? Remember when I won that here! Yay! The manger scene under the table is the one I shared here. The grands have stockings hung by the chimney. Another nativity set--Ella has been at work on it. to gather all the figures around the Baby Jesus? It's like they want to protect Him--the one who came to protect us! The New England village is above the windows. I showed you the latest addition to here. the printing office, church, post office, and the school. Here are the lighthouse, the glass works, general store, and a flag shop. The last part of the village--the farm with the deer moving in the woods nearby. One more Santa greets us at the kitchen table. This cute little tree was a recent gift to Lee from a new friend. a gift from friends we have known for several years. Both gifts are cheerful additions to our Christmas decorations this year. They are displayed in our bedroom. Thank you so much for coming to visit me today. I enjoy having visitors and I LOVE Christmas! You can find more homes to tour at Boomama's. I hope you are having a joyous time preparing for Christmas! I will be hosting my Tour of Homes gala a day late. I may miss the Boomama Extravaganza list/ However, we will party at the House of S. I had a couple of technical problesm. In addition, there are just some days that we don't feel like partying around here. This has been one of those days. Tomorrow (Tuesday) will be a better day! 1In those days Caesar Augustus issued a decree that a census should be taken of the entire Roman world. 2This was the first census that took place while Quirinius was governor of Syria. 3And everyone went to his own town to register. 4So Joseph went up from the town of Nazareth in Galilee to Judea, to Bethlehem the town of David, because he belonged to the house and line of David. 5He went there to register with Mary, who was pledged to be married to him and was expecting a child. 6 While they were there, the time came for the baby to be born, 7and she gave birth to her firstborn, a son. She wrapped him in cloths and placed him in a manger, because there was no room for them in the inn. 8And there were shepherds living out in the fields nearby, keeping watch over their flocks at night. 9An angel of the Lord appeared to them, and the glory of the Lord shone around them and they were terrified. 10But the angel said to them. "Do not be afraid. I bring you good news of great joy that will be for all the people. 11Today in the town of David a Savior has been born to you; he is Christ the Lord. 12This will be a sign to you. You will find a baby wrapped in cloths and lying in a manger. 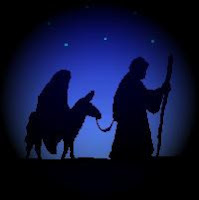 16So they hurried off and found Mary and Joseph, and the baby, who was lying in the manger. 17When they had seen him, they spread the word concerning what had been told them about this child, 18and all who heard it were amazed at what the shepherds said to them. 19But Mary treasured up all these things and pondered them in her heart. 20The shepherds returned glorifying and praising God for all the things they had heard and seen, which were just as they had been told. It's Friday! That means it is time for Show and Tell! Run on over to Kelli's and get in on the fun! We have a collection of Nativity scenes and sets. We have collected them from a variety of places. some we have bought ourselves from places we have traveled; others have been gifts. Some of the pieces are actually tree ornaments that we hang on our "Nativity Tree" that is in our living room each year. I shared that tree earlier this week. The Nativity that I'm sharing today is the first one in the collection. My husband gave it to me Christmas 1971. We moved to Tennessee early that year. We had experienced a lot of change and endured the added grief of losing an infant daughter that year. This was the first Christmas that we would not be with family. We could not travel to be with family because we were expecting another child and the doctor had advised me to not travel. Although we were excited about the coming birth of another child that Christmas was a lonely time for us. Lee brought this to me before Christmas. It has always been one my most precious Christmas memories. This precious picture is of Lee and our oldest son, Greg. Greg was not quite two in this picture. He is the child we were waiting for when Lee gave this Nativity scene to me. His little brother, Kevin, was born not long after the Christmas of this picture. (Yes, I know G looks big for a child who is not yet two--He was! He is a tall man)! Thank you for coming by so I could share this Christmas treasure with you. I hope you are enjoying the days leading up to Christmas. It's Time to Rock Around that Tree! A LITTLE ROCKIN' ROUND THAT TREE?! LET LITTLE MISS BRENDA LEE LEAD US 'ROUND THAT TREE! Morning Glory, who is always thinking of interesting things for us to do, is the hostess for Christmas Tree Treasures. You might want to go on over to Seeds From My Garden and get in on the fun. Morning Glory has offered some questions/topics to guide us. I have added a couple of subjects to help tell the story of this tree. We have two Christmas trees. One is in our family room and has all kinds of ornaments on it from angels to Santa Claus and Snowmen. It is the one where we will put the gifts. The family will gather there to share those gifts. The tree I'm sharing today is in our living room. It is a relatively small tree--at least it is thin. I call it our Nativity Tree. We have been doing this tree for about eight or nine years. I really like having it as a part of our Christmas traditions. This pretty little angel sits atop this tree. She symbolizes the angels who announced the birth of Jesus to the shepherds on that night long ago. I don't use a real tree skirt on this tree. The tree in the family room has a red and green sparkly skirt, you can see when we have the tour-o-homes next week. I keep looking for just the right skirt for this tree and haven't found it yet. I use a combination of a length of fabric that started life as a sheer window curtain and a velvet throw with beaded fringe. The important "base-of-the-tree" item on this tree is the ceramic nativity set that I put there each year. It sits on top of my improvised tree skirt. It was made by a very good friend and given to me by my husband for my birthday several years ago. Our friend did some remarkable pottery and nativity sets during the time this was his hobby. He has moved on to a more dangerous hobby (He built an airplane and flies it!). We can no longer get these very special items. Putting this in place is one of the highlights of decorating for the season. * What goes on your tree first? I don't have a particular item that goes on first. I do put some plain gold ball ornaments on first so I can get them into the center of the tree and near lights so they reflect some of the sparkle. And then the nativity ornaments go on! •Some of the Nativity-themed ornaments. All of the ornaments on this tree have to do with Jesus. Some of them are sets that tell all or a part of the story of the Baby's birth. Some are individual ornaments depicting one element of the story. We have collected ornaments when we travel and some have been gifts. They are all treasured. You may have to take my word for it! (Photography is not my strong point! )These have gold pictures of the three wise men on them. There are several of them on the tree. Joseph, and three Wise Men. Of course there lots of angels, some stars, and a few little churches. This is a sampling of the angels on the tree. • I have some ornaments I save to go on the tree last. These are olive wood ornaments that we bought in Israel when we were there in 2000 for the taping of the Beth Moore Bible Study, Jesus the One and Only. (My husband was the executive producer for that project and other video-based Bible studies until he retired in 2005). These ornaments are the typical tourist ornaments that many travelers to Israel buy. 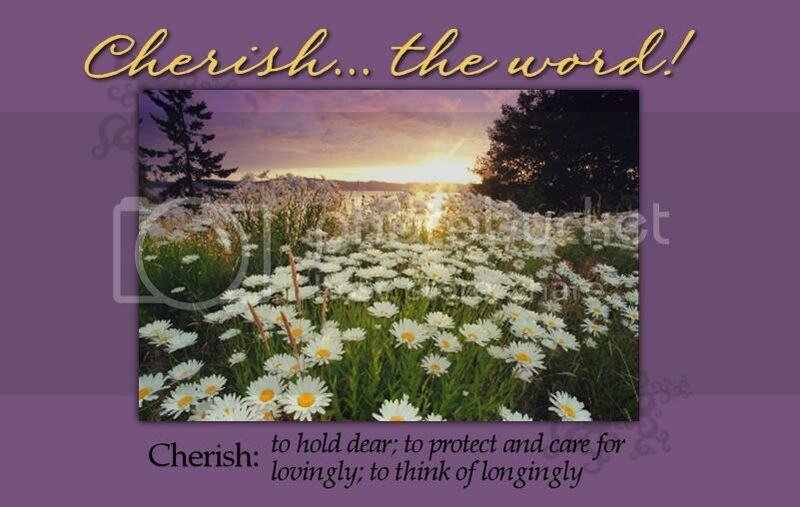 They are a lovely reminder of a very cherished time in our lives. • Here is this year's version of the Nativity Tree. This tree is one we used in an apartment we lived in when our house was being built. It is a "skinny" tree and fits right in this little spot in our living room. I almost replaced it this year, but decided it would go one more time. I started to pass on this, but it's just too easy to do. AND--I don't like to be left out of the fun! So--Here goes! I don't cook anything very complicated. So, if you're looking for something easy to prepare, this is your place! Now, I know every one and her sister does some version of this one, but it is our favorite. 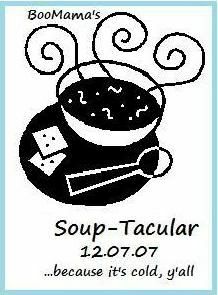 I have used so many versions of this soup, I have really forgotten where I got it. The great thing about this recipe is that you can easily adjust it to what you have in the pantry/refrigerator. • 2 lbs. ground meat--browned and drained==Or--Cooked chicken cut in cubes or strips--Or, if you are in a hurry just pour in 2-3 cans of chili without beans! • 1 can (4 oz.) chopped green chilis, undrained--optional OR use Rotel tomatoes and adjust the amount of stewed tomatoes you use. Brown meat and onion, drain. Add remaining ingredients, cover and reduce heat. Simmer one hour. Top individual servings with tortilla strips and cheese. I have also prepared this in a slow cooker. Actually, this is a great basic soup that you can customize to your own needs/liking. You can change the meat just about anyway you like it. We use chicken more than beef. The vegetables can also be adjusted. You can use whatever beans you happen to have in the pantry. I often use green beans instead of pinto because we like it that way. Hominy can be substituted for the corn. I even put potatoes in sometimes--a couple of potatoes cubed or a can of diced new potatoes, drained. Just adjust the vegetables anyway that works for you. Just a simple, delicious beef stew! Brown beef in oil. Add onion soup mix, tomatoes, water, and chili powder. Simmer for 30 minutes. Add carrots, celery, and potatoes. Cook covered for one hour. Somebody Is Having a Birthday! This is us when I was seven and she was nine. This is us this year with our step-sister. 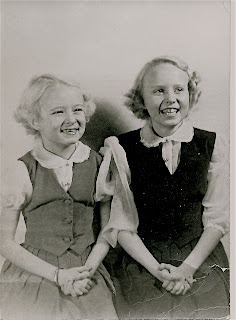 Barbara, I'm glad you're my sister! What a tragedy in Omaha yesterday! My heart is broken for those families and the community in general. Unfortunately, some people, in their own despair and anger, use this season of the year to disrupt the lives of others. I'm sure you are joining me and others as we pray for all concerned. I received the following information in an email. It comes from a member of the local Board of Paroles and Probations. I think it is a good reminder to us to be aware and protect ourselves from some of the danger that is around us as we innocently go about our business. Using these tips would not have changed anything in that mall yesterday. But some other dangerous situations might be diverted if we are more aware of our surroundings and follow these and other safety suggestions. "This is good information for all of us. In our criminal justice meeting this morning, which includes Chief of Police, DA, judges, etc. We are suggesting that women carry money and a credit card and driver's license in our pockets in a small coin like purse on our bodies when we go shopping and stop carrying purses, especially during this season. From our records it is obvious it would be a good thing to do all the time. You would faint if I told you the number of these cases the police are dealing with daily. They hardily recommend not carrying a checkbook at all because that is even more valuable to thieves than your credit cards. It has your bank number and usually your address and phone number. Put your keys in your pocket. Clip your cell phone on your waist. Be alert at all times! Don't pop your trunk from a distance or unlock your car until you can reach out and touch the door, then get in quickly, lock the door and leave. Women have a bad habit of sitting in their car doing their makeup or deciding what is left on their shopping lists or talking on the phone. Pull out and move on. Valet parking is your best friend. Just a little friendly parole board guidance for those I love. This is what we are telling all our female officers who are on the dangerous streets all day and what the justice professionals are telling their female family members." Just some suggestions. I'm sure you have heard similar tips. Please share with us in comments or at your own place. Let us know if you post on this subject so we will be sure to come read. Let's help each other stay safe. Do you have a "hearty" soup recipe to share? Bomama is looking for some good soup recipes. Click on the button to get the info. 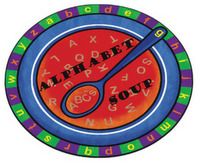 Alphabet Soup is hosted by Morning Glory at Seeds From My Garden. Why don't you go over to her place and get all the scoop on participating. We have fun with it every Wednesday! OOPS! I just checked at Morning Glory's and she is not hosting Alphabet Soup today. Hmmm--Oh Well, I have it ready to go up, so I'm going to leave it. I'll adjust next week! Here is my list of things in my life that "bring me joy, happiness, or just plain humor." This is a Christmas Version of Alphabet Soup, brought to you by the letter O.
O Holy Night--One of my favorite songs of the season. It is definitely one of the carols that reminds me best that amidst all the hustle and bustle I must stop and remember why we celebrate--"It is the night of the dear Saviour's birth!" Others--My husband and I enjoy the giving part of Christmas. It has always been one of our joys to choose gifts for our children. The shopping (online now), wrapping, and watching them open the gifts are highlights of our Christmas. We have also enjoyed sharing parts of Christmas through the years with friends. Our social life is somewhat limited now because of illness, but we still look forward to visits from friends during the season. We treasure the memories of parties, dinners, gift-giving, and visits we have shared with family and friends during this blessed season. Others also include people that we reach out to in ministry through gifts to the Christmas Toy Store, mission offerings through church, contributions to organizations like Second Harvest Food Bank, and my husband's writing through a radio ministry called Christ to the World. Any effort to help others, at Christmas or other times of the year, enriches our lives as well as those we seek to assist. Oranges--When I was a little girl we always got an orange in the toe of our stocking on Christmas morning. I remember that we used our own socks for hanging. My sister and I would always talk Daddy into loaning us one of his--for obvious reasons! We also could expect nuts, a candy cane, and perhaps a candy bar, and a small toy. You can go here for a history of the Christmas stocking. Okra Pickles--This may be the best kept secret of Christmas dinner at my house. I have served them almost every year. I think I am the only person who eats them! But, I want them at Christmas; so, they are right there along with the sweet gherkins and deviled eggs that others in the family look forward to. If you've never had them, I recommend you give them a try. Look here for the brand I buy--note the Texas connection! "Makes Your Mouth Happy!" Orient--The story of the three Magi from the East is told in the song, "We Three Kings of Orient Are " The story was first told in Matthew 2. You can read it here. Ornaments--Don't you just love putting the ornaments on the tree, recalling where or when you got each one, choosing just the spot you where you want to hang it on the tree. When you think about it, that is a strange custom! Exactly why do we do we hang ornaments on trees for Christmas? You can read the legend here. Organization--Yes, it has something to do with Christmas! I have my decorations fairly well organized. However, I think this year before I put things away I will do a purge and downsize a little. That means I will have to reorganize the bins and boxes before they are put away for 2008. I may need to check this out. PLEASE, SANTA, DON'T CHANGE YOUR WAYS!!! Do You Wear Holiday Fashions? Yes, No, or Occasionally? Do you wear Christmas clothes? You know--sweaters, sweatshirts, even a little jewelry! My answer is--Not so much anymore. But you know, I am a retired educator. Teachers, especially elementary teachers, are probably the major supporters of the holiday clothing industry. We have ABC-123, Christmas, Valentine, Thanksgiving, St Patrick's Day... You name it, we have "cute" finery for it. So--when I did a major closet cleaning recently I found leftovers hiding in the back. Yes, I really wore these things! Sorry, but you will miss seeing the snowman sweater with the strategically placed tassel on his hat! What was I thinking! Anyway--he went to used clothing heaven (Good*will) several years ago! Drum Roll, Please! Here's the "fashion" show! The picture is a little dark. Here's a fetching little number. than I like. I know! I know! Green, for a change of pace! When you are not really in the mood for a sweater, try a denim shirt. city's schools I would not be wearing denim. Now, I have a question for you! The Fashion Show Grand Finale! Our good friend from the World of Mouse! I have had him for YEARS! So here's my challenge to anyone who would like to take it. Share with us your holiday sweaters. Maybe your collection is holiday jewelry. You know, a few ear ornaments!